This week we have chosen five of the best blouses. 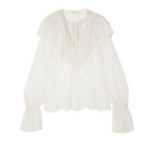 We are still in the middle of what seems to be a never ending heat wave in the UK, so a light breezy blouse is a great option for evenings out (you won’t be needing a jacket that’s for sure). So we thought that blouses are a great way to stock your wardrobe for now, and also for the transition into cooler days. Below we have selected our favourites and added some styling suggestions too. First up, this pretty pint shirt, by &OtherStories. Pair with some white denim and tan coloured mules. To dress this up a tiny bit more, add some statement gold earrings. Animal Print is huge, and is going to stay that way coming into Autumn and Winter, so what a great way to update your wardrobe now with a transitional piece. Wear now with some denim shorts, and pair with dark denim when it cools. For a more subtle injection of animal print, this Topshop Blouse is perfect. In a pretty pink shade, this would look great paired with a floaty wrap skirt and some mules. A bit more fancy now. Pair this stunning lace blouse with a silk slip skirt for an easy, dressed up look. 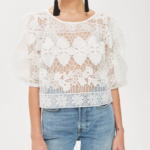 Peasant Blouses are also huge right now, we love this Philosophy Di Lorenzo Serafini Lace Blouse. Pair with s leather skirt to toughen the look up or some leather Moto pants.